There is not a way to make a change to a MEETING that includes other people without SENDING the updated information to them. There is no such thing as SAVE on a MEETING. You can make an APPOINTMENT for yourself and make changes and SAVE them, but that is because it is an APPOINTMENT. The second you add an additional person it becomes a MEETING. When you create an appointment it involves no one but yourself. The button at the top left is Save as shown below. When you invite other people, an appointment becomes a meeting and the Save button becomes Send as shown here. This is by design and automatically changes that meeting information on the other people’s calendars. This is NOT a difference in how you access the calendar, it is a difference in the type of calendar event. In the event that an additional person or person(s) need to be added to an existing meeting or if you get a request for another meeting invite from someone who lost the original, open the meeting and then from the Reply drop down choose forward and email it to them again. There are more instructions that show this difference here. Making a plain link is easy as all you have to do is type the link and the email program recognizes it for what it is, BUT what if you want to make a link that doesn’t have the same name as the link. For example, when we say click here, we want you to see and click on the word here and have it take you to somewhere else, like a web page. The insert link dialogue pops up. Enter the address of where you would like the email recipient to go when they click on your link. For example..http://help.eppleyits.com to visit the help blog. FYI-for those who are used to creating links with a keyboard shortcut, they also work here. 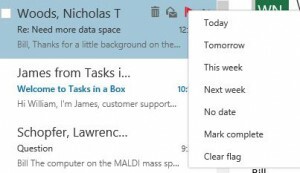 Folders you created in the previous version of the outlook web app are still there. A couple lines below your inbox should be a link that says More. 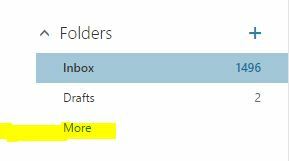 Click on that and it will show your full inbox below with the subfolders inside. The inbox that you see at the top is only the inbox itself and doesn’t show the subfolders. and then if you go to your tasks you can see a list of all the items you’ve tagged and when they are due. Another quick tip for anyone who didn’t know already. If you want to separate one the tabs you have open in your browser into a separate window, just grab the tab and pull it out of the browser window and it will make it’s own. This is especially handy for those who have multiple monitors who would like to leave one things open all the time while they do other things in the browser. Excellent question. The official answer is Internet Explorer 11. Extensive testing however, shows the current Google Chrome works pretty much flawlessly for the email system as well. Firefox, Safari, and various other browsers have been very poor. If you have an older PC running Windows XP (or Vista) you are not going to have the best email experience with IE, because your browser is old. Google chrome will still perform well on most of those systems but not all. 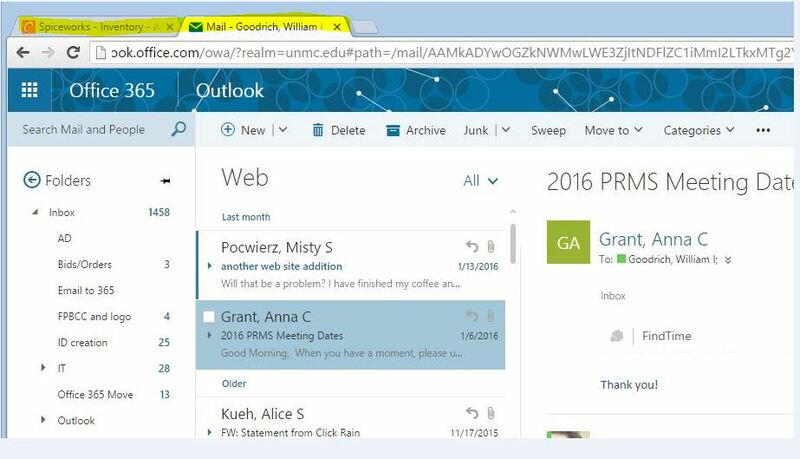 On Tuesday, February 23rd, 2016, all Eppley faculty, staff and student Outlook email accounts are scheduled to be moved from the UNMC premises to a cloud hosted by Microsoft. The migration is scheduled to start at 1:00 am and complete by 4:00 am. It should be complete when you come in to work on, February 23rd. You will need to delete your current profile (email setup) and set it up again with new information. The information and instructions on how to set up your UNMC Outlook Email on your mobile device can be found at à [Instruction for Mobile] [Video]. By default, if you Reply or Reply All to an email message with an attachment, the attachment is not sent again. If you forward an email, the attachment is retained. There are times when replying with the attachment is necessary though. Be warned that a reply all with an attachment creates a large amount of traffic and increases the size of the email boxes of everyone you are emailing. Note, the pictures in the original article seem to have disappeared but the instructions will work without them. Reply with attachments by manually copying and pasting We can manually copy original attachments in an email messages, and paste them in the Reply Message window when we reply the email message later. Step 1: Click the email message to preview it in the Reading Pane. Step 2: Right click one attachment in the previewing email message, and select the Select All from the right-clicking menu. 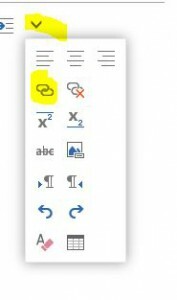 Step 3: Right click the selected attachments, and select the Copy from the right-clicking menu. Step 4: Reply the email message with clicking the Reply button on the Home tab (or on the Toolbar in Outlook 2007). Step 5: In the Replying message window, click the Paste button on the Message tab to paste these attachments. This question comes up periodically because there are several places you can “delegate” access in Microsoft Outlook. If you don’t delegate properly in this spot, however, none of the others will work for you.